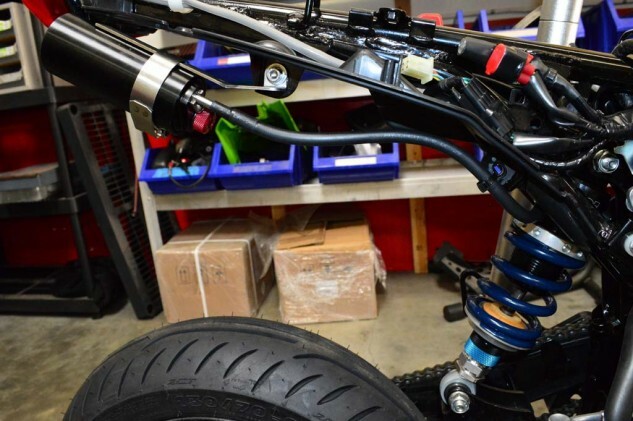 If you’ve been following Motorcycle.com lately, you’ll have noticed a recent Top 10 about Honda Grom modifications. The list, of course, was a teaser to a bigger event a few members of the MO team participated in: a 24-hour endurance race. We’ll get to that story in the coming weeks, but we’re getting ahead of ourselves here. Before we could ever race a Grom, we’d have to transform it from the little funster that it is in its stock condition into a dedicated kart-track destroyer. 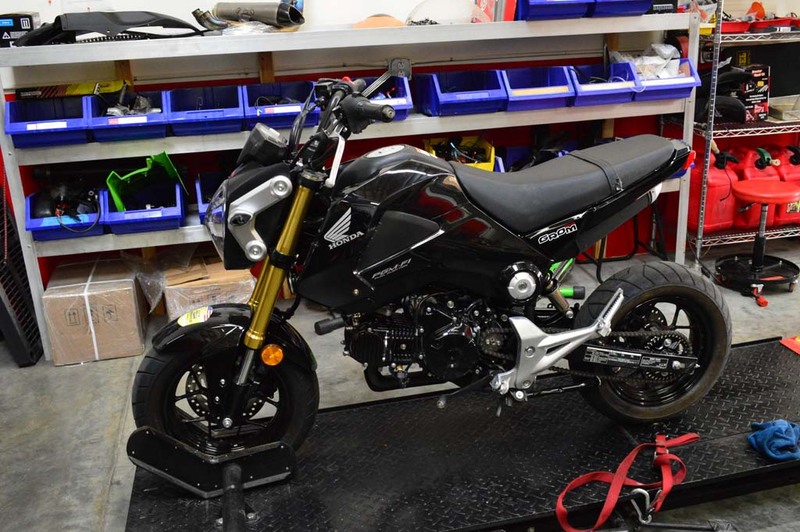 When we delved into what kinds of items are available from the aftermarket, we were shocked to discover the breadth of what can be bought to transform the Grom into something much more serious. The Top 10 mentioned above listed the players who contributed to this project, but they are worth mentioning (and thanking!) again. Major kudos to Steady Garage, Blue Monkey Motorsports, Woodcraft Technologies, Spiegler, JRi shocks, K-Tech suspension, Lindemann Engineering and Brock’s Performance for the support and generosity they provided for this project. 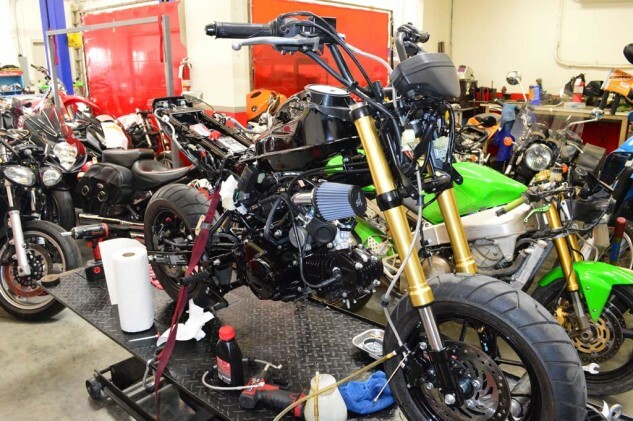 With less than a week to build our Grom into a racer, and nearly all of our staff resources dedicated to our nine-bike Ultimate Sports Adventure-Touring Shootout, there wasn’t much time for us to do the wrenching. 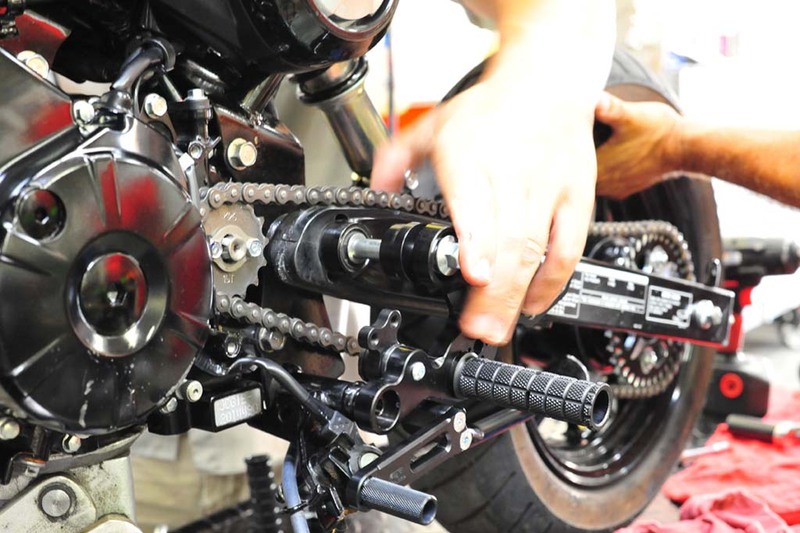 For this, we were incredibly thankful Will Kenefick – proprietor of Motorcycle Service Centers LLC. 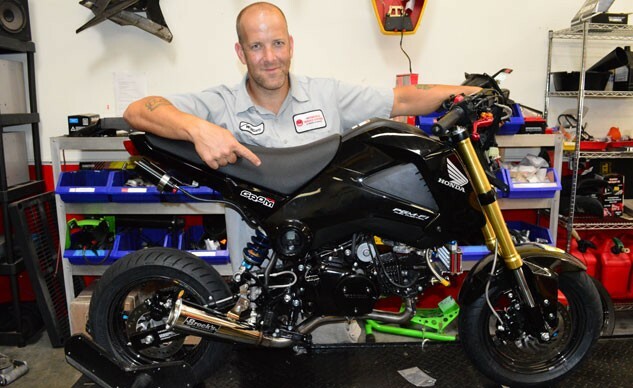 in Camarillo, California – stepped up and offered to help transform the Grom on such short notice (meanwhile, I’d be taking pictures). 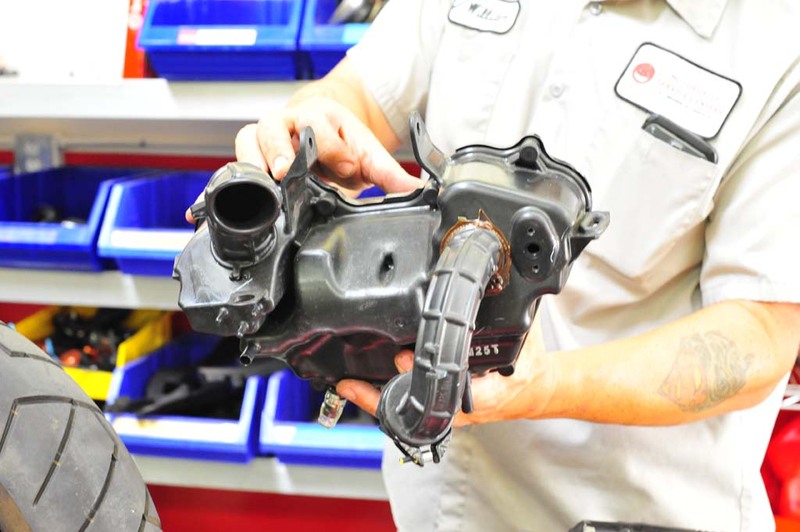 Conveniently, Kenefick and MSC is also one of a handful of K-Tech authorized Service and Tuning centers in the country. 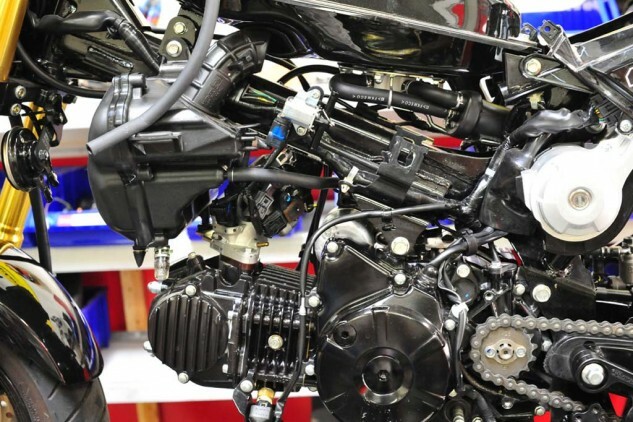 Kenefick’s background in motorcycle tuning could fill the pages of MO, but a short history includes wrenching in World Superbike, as well as creating the motorcycles used in the Transformers movies. Click on the MSC link for a more detailed bio. 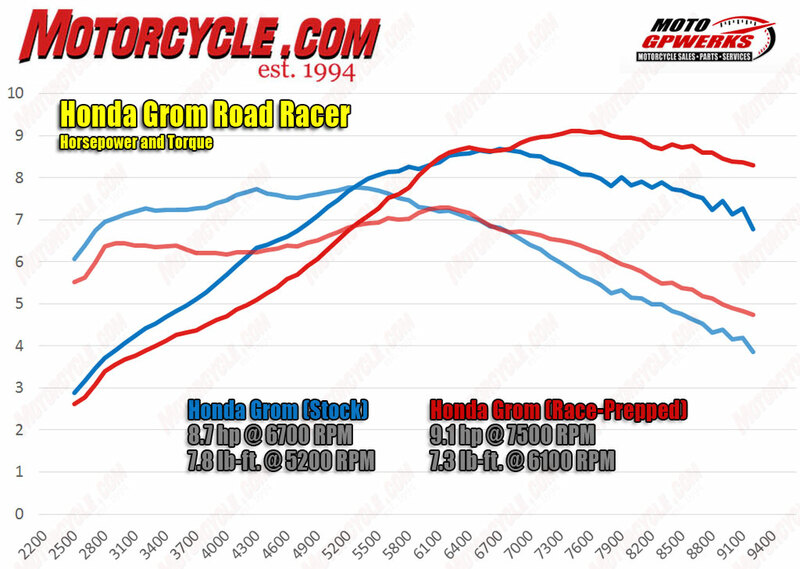 After all was said and done, our race-prepped Grom put down 9.1 horsepower and 7.3 lb-ft of torque on the MotoGP Werks dyno, versus the stock numbers of 8.7 hp and 7.8 lb-ft. That comes out to a 4.5% increase in power, but, interestingly, the torque number took a dive by 6%. Take a look at the dyno chart below and you’ll also see the stock Grom is noticeably more healthy in the midrange (after the race we tuned the engine again on the dyno, replacing the hi-flow oil pump with the stocker and playing with different mapping. Ultimately, we netted 9.9 hp and 7.6 lb-ft. So, more power, but slightly less torque than stock). 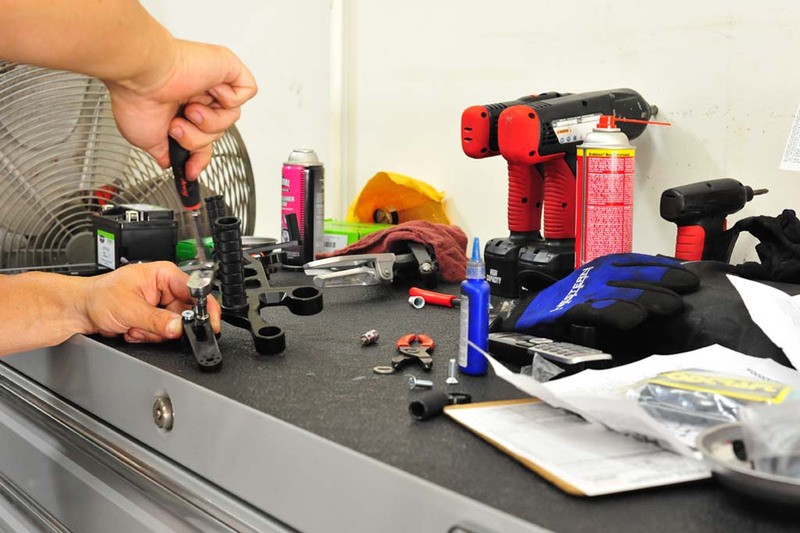 This definitely came as a surprise to us, but with our new wet weight of 187 lbs, the whopping 38 lbs of stuff we shaved off the stock bike will help us overcome this deficit. This just goes to show that shiny new parts aren’t necessarily better than the stock components. But that’s where we are now, and since a picture is worth 1,000 words, our Grom build will be told in a pictorial to better take you along for the ride. 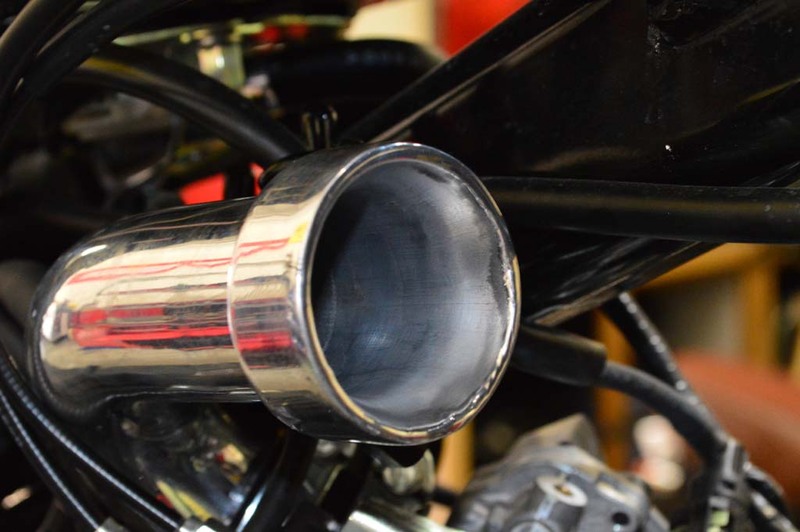 We expected to see our Grom make a little more power after the intake and exhaust mods, but we were happy to have much stronger over-rev power for our high-rpm thrashing on a racetrack. What we weren’t expecting was a significant decrease in power below 5500 rpm. When it comes to the Grom, you need every drop of power you can get. Any racebike build starts with removing as many unnecessary and/or heavy items from the bike as possible. In this case, the stock exhaust was ditched. Instant 11-pound weight reduction. Also removed were the mirrors, turn indicators, headlight, license plate bracket and rear fender. We shaved weight wherever we could, including the wiring harness on the left switchgear. 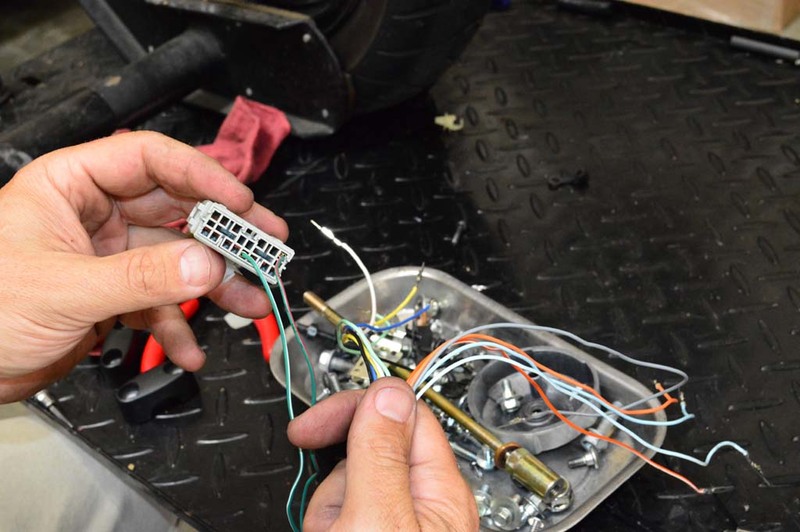 Since this Grom wouldn’t need any of its lights or indicators, the associated wiring was removed (right hand). All that remains in Will’s left hand are the essential wires allowing the bike to start in gear with the clutch pulled in. We’re starting the actual build with the Woodcraft rearsets for reasons which will make sense further down. Shown here is the remains of our stock shifter setup, the result of a crash during pre-race testing (Thanks, Tom!). Clearly, new rearsets were vitally important. Not only for their crash worthiness, but also for the added ground clearance. 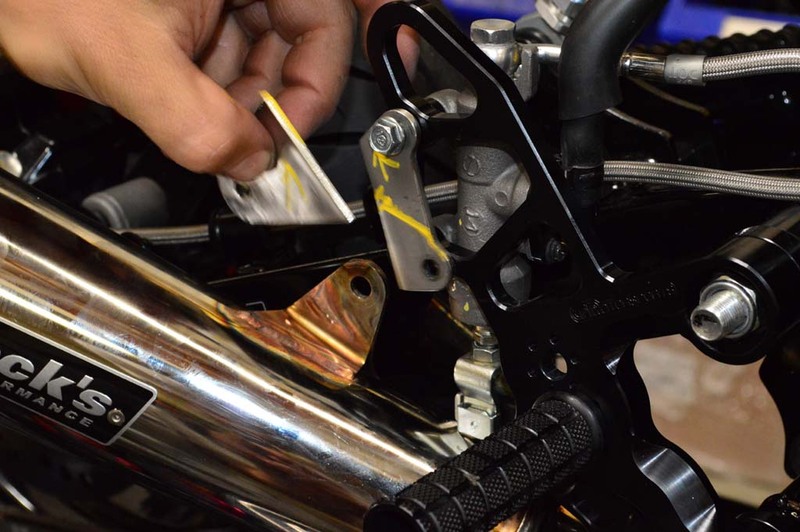 The top bolt of the peg bracket doubles as the bolt keeping the swingarm in its pivot. Remove that and the bottom bolt, plus the associated plumbing and hardware for the shifter and rear master cylinder, and the stock peg comes right off. 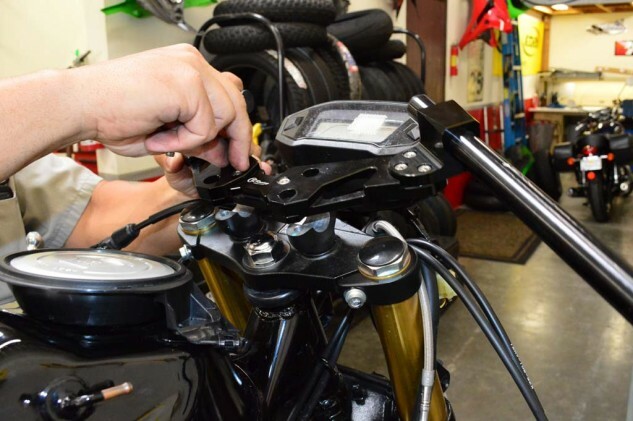 We found it was easier to assemble the peg and arms for the Woodcraft rearsets off the bike. 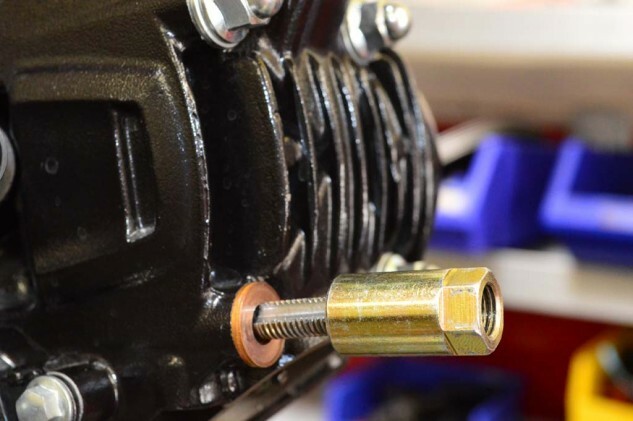 Very important: remember to use blue thread locker (liberally), as the vibration of the 125cc Grom engine in race conditions can loosen the bolts. For the most part the Woodcraft rearsets are simple to install and well thought out. However, in order to install the shifter tip, you must first install a plate over the main shift lever. 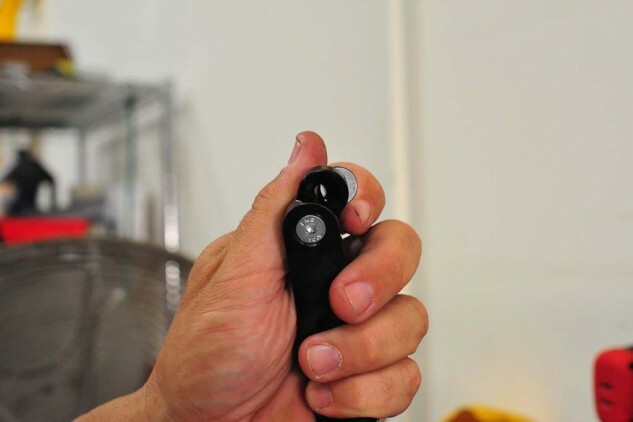 This makes installation of the shift tip more complicated than it has to be, in our opinion, and makes it more time consuming to tend to in the event of a crash. Installation of the rearsets is relatively simple; thread the long bolt through the shift side, then the swingarm, then the rear brake side. Then tighten top and bottom bolts to factory specs. The bottom bolt hasn’t been installed yet in this photo, but with it in place you can then adjust the shift lever to your liking. 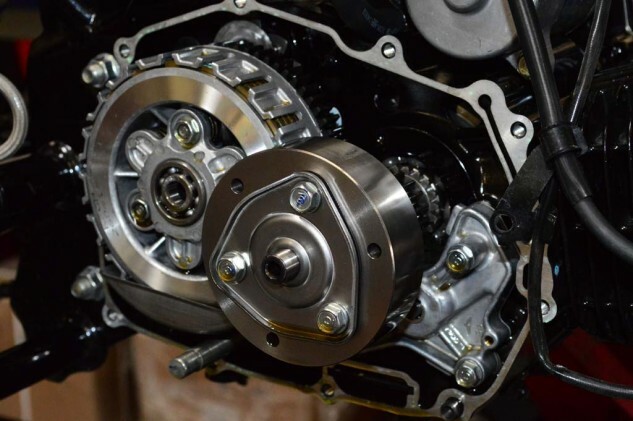 The kit is also able to be used in standard or reverse shift patterns. 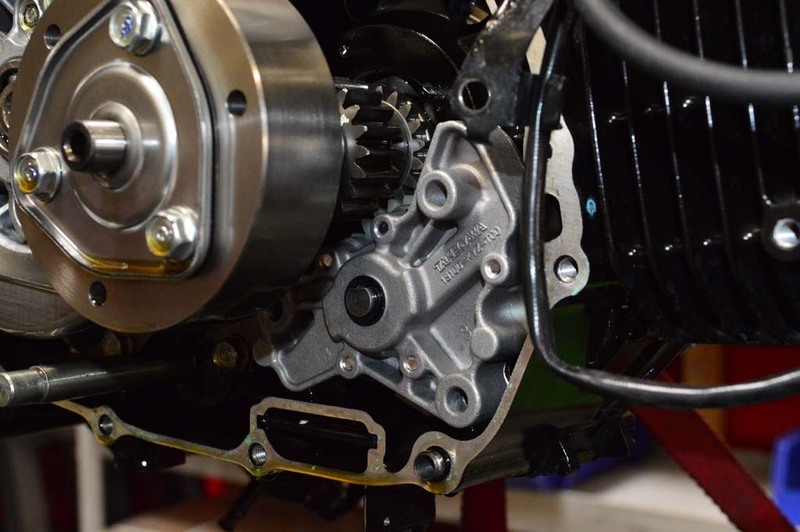 However, the stock countershaft sprocket cover is not compatible with the kit. We removed it in our case, but Woodcraft also sells a modified cover with the proper clearances. 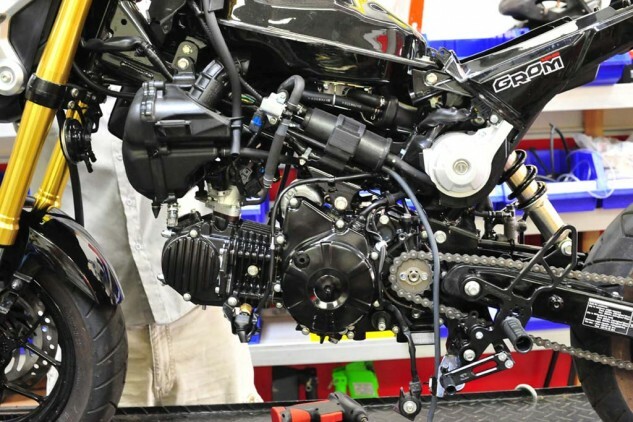 With the left fairing removed, we see the exposed engine, airbox, evap canister, and associated hoses and wires. We’re going to clean this up. …Then the stock airbox came off. What’s left is a bare engine and throttle body, which will soon be paired with the Chimera air intake from Brock’s Performance. 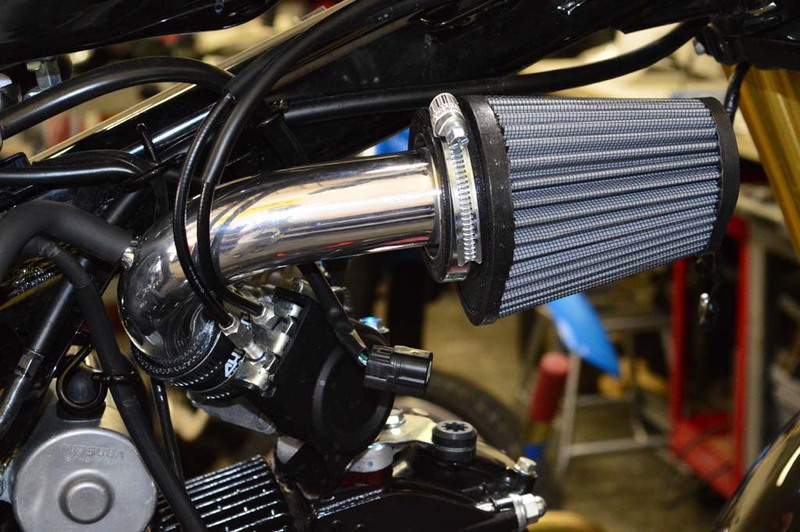 The air intake is a simple piece, with hose clamps connecting one end to the throttle body and the other end to the Sprint Filter. With the air filter removed, we see the smooth and rounded port the intake air will travel through. At this point in the build, it was simply easier to remove all bodywork for easier access. …replace the bottom right stud with the supplied, elongated stud, making sure the flat surface is still exposed and facing upward. This is important because, combined with the gold collar threaded to the stud, this will serve as the oil supply line to the cooler. The Steady Garage oil cooler kit comes with a pre-fabricated mounting bracket that bolts to the bottom two studs. The gold collar seen in the previous picture is used to help bolt the bracket/cooler in place. The AN fitting will then thread into it. 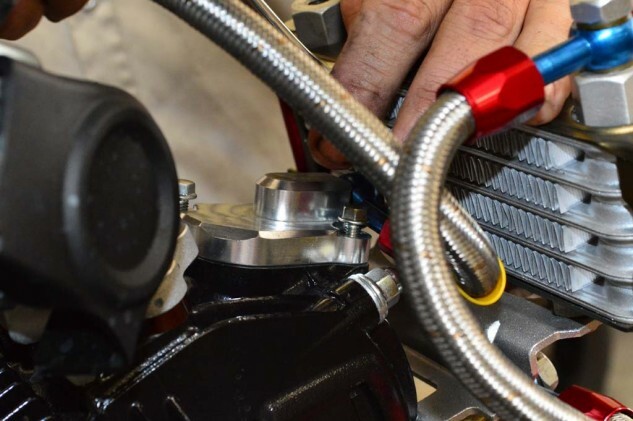 The supplied billet valve cover simply bolts into place using the supplied hardware. Clearance between the radiator and AN fitting can be a little tight for a box-end wrench. Less of an issue with an open end. The finished product. Remember to use fresh crush washers at each fitting. We were forced to use a used crush washer for the feed line at the bottom, creating the potential for an oil leak. 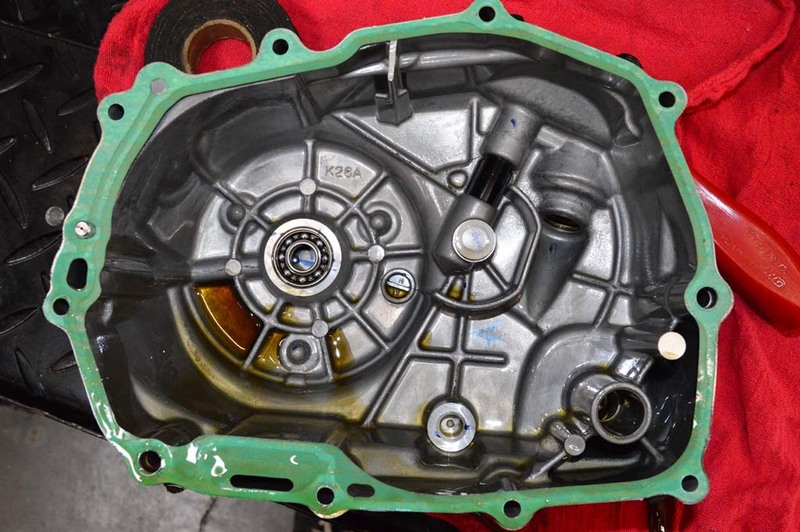 …If you’re careful and/or lucky, the stock gasket will remain intact once the cover is removed. It’s a good idea to have a replacement gasket in case the stock one doesn’t cooperate upon removal. With the cover removed we see the clutch basket on the left and the stock oil pump on the bottom right. Takegawa unit on the left, stock on the right. Installing the new unit is as simple as taking out the old and putting in the new. Just be mindful of the gears when installing and don’t force anything. Re-install the three bolts holding the pump in place, and you’re done. 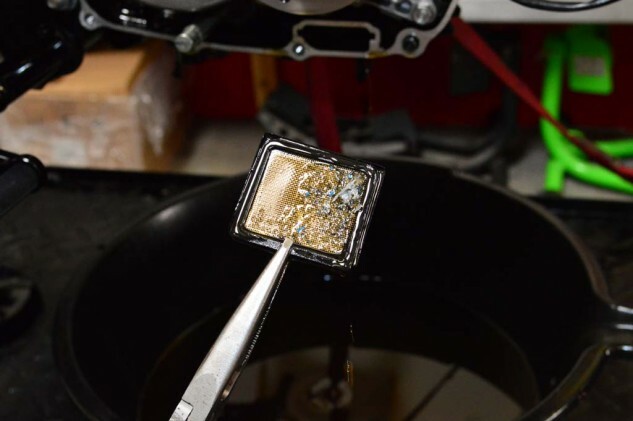 One final note about oil: the Grom doesn’t use a typical oil filter, just this screen that slots into the opening in the case at the top of the picture. As you can see, ours was filthy. Be sure to clean it regularly. …however, the Alien Head exhaust system was designed to clear the standard footpegs. 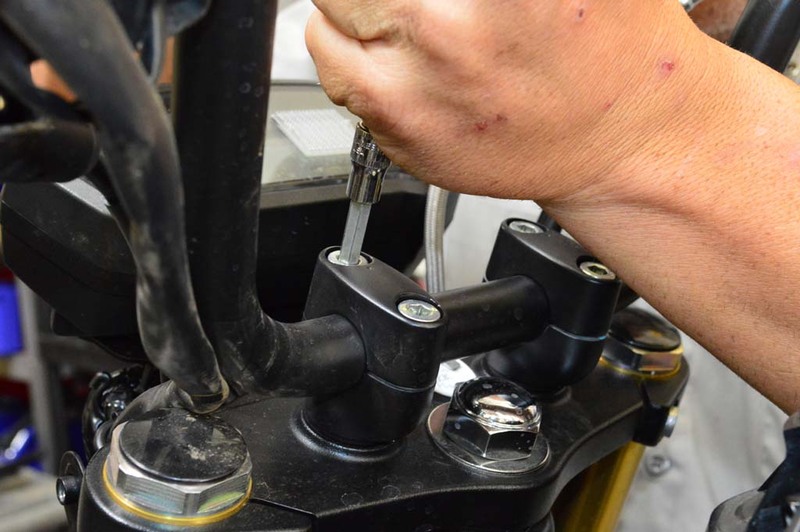 With our Woodcraft rearsets in place, the megaphone makes contact with the rear master cylinder plunger. We didn’t take this into account when ordering parts. With time ticking away, the solution was to fabricate a new exhaust bracket that would push the megaphone just enough to clear the plunger. Had we more time, simply ordering a high-mount pipe (also available from Brock’s Performance) would have been the better solution. 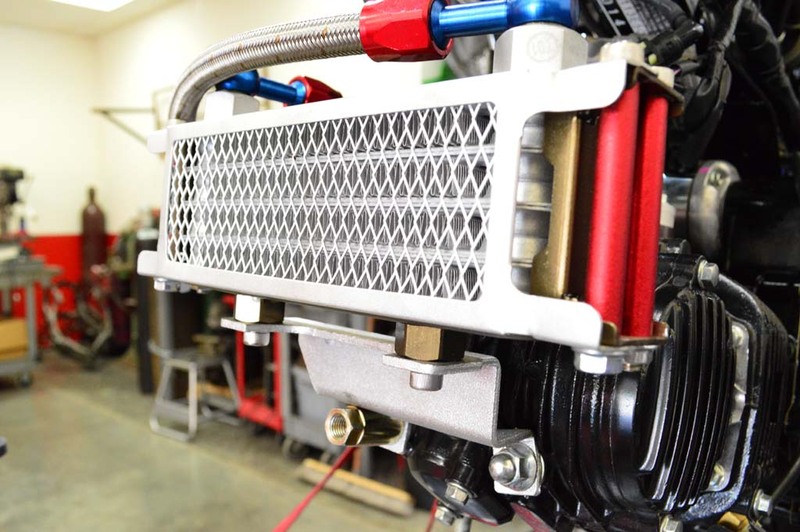 Now that our air/fuel ratio needs have changed with the addition of the intake and exhaust, we also installed a Power Commander V from Brock’s Performance, pre-mapped from Brock’s shop. The map is top secret, but was developed from testing on both the dyno and actual runs down the dragstrip. After the engine work was finished, the next area to tackle was the underdamped suspension. 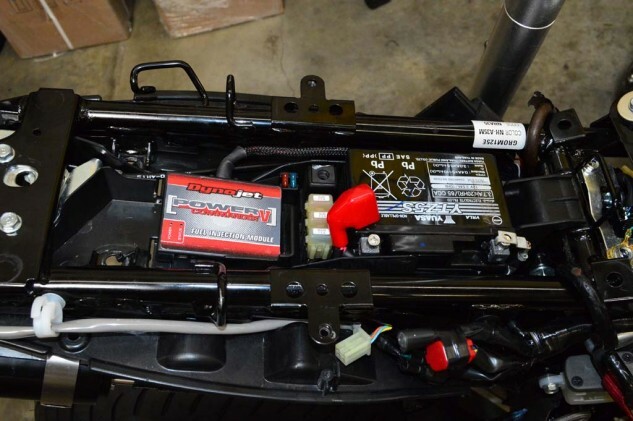 Since the shock is easily accessible, we tackled this first. 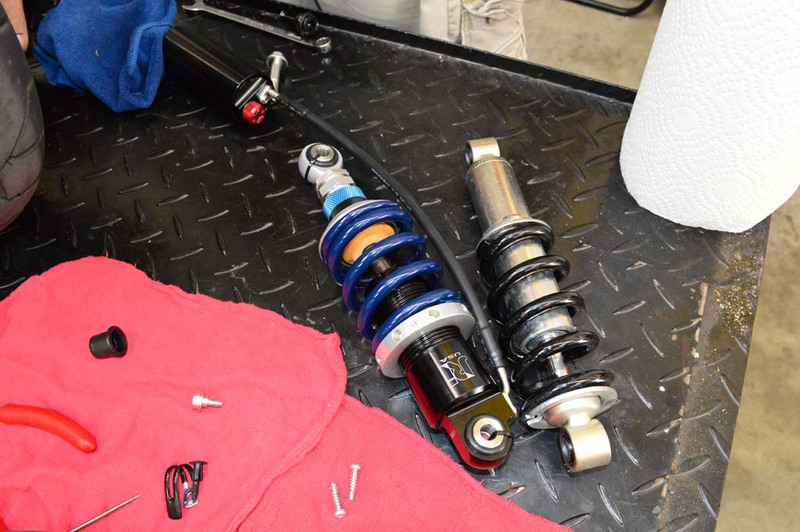 Unlike the stocker, our JRi shock is adjustable for preload, compression and rebound. JRi goes the extra mile and springs each shock to the rider’s weight, but since there would be five different riders on this bike varying from 145 pounds to 260 pounds, JRi’s Tige Daane had to compromise and spring it for a 160-pound rider – Sean Alexander would just have to deal with a softly sprung motorcycle. 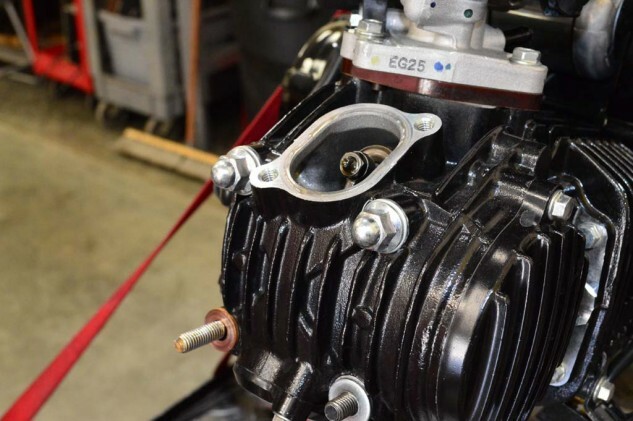 It’s difficult to distinguish in this picture, but our JRi shock is longer eyelet-to-eyelet than the stocker, though Daane can change this, too. 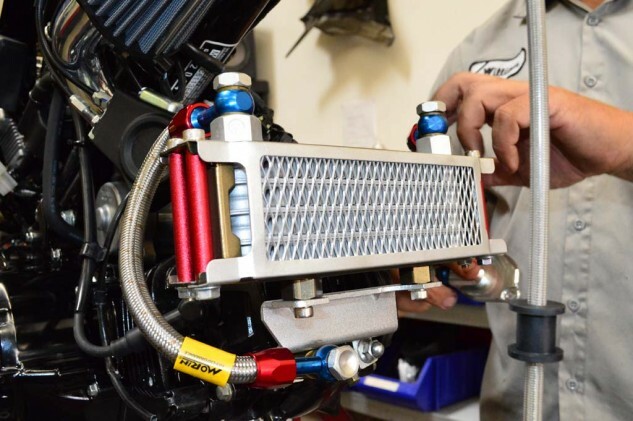 Installation of the shock is a straightforward affair, and since we’re running a low-slung exhaust, the stock exhaust bracket made a perfect mounting point for the JRi’s remote reservoir. 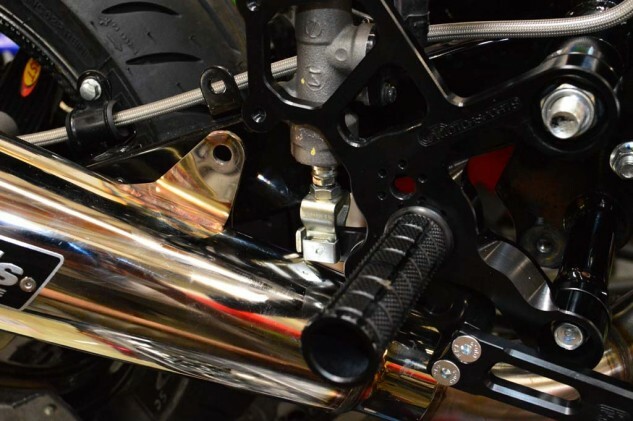 Like the rear, the Grom’s stock forks are woefully underdamped for track duty. 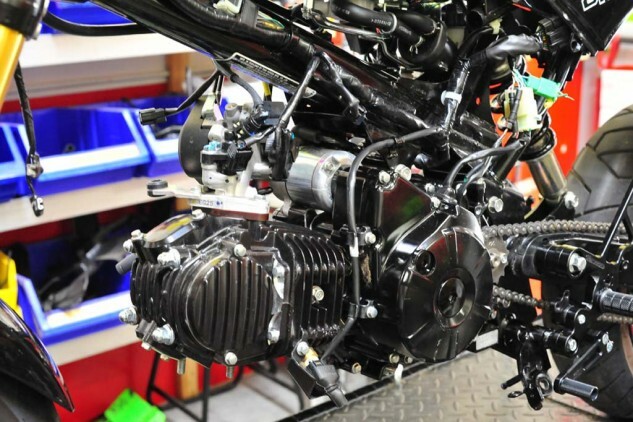 The K-Tech fork kit not only comes with stronger 6.5Nm springs (stock is 5.0Nm), but also features rebound adjustability in one fork leg and compression in the other. Unlike most other motorcycles, the Grom’s springs are accessible from the bottom of the fork tube. To remove the lower (which uses a reverse thread), a torch is required to dissolve the adhesive between the lower and the stanchion thread. Then, using the front axle and some elbow grease, the lower will screw off. This is the point we realized Tom’s practice crash that destroyed our left foot peg was more serious than we thought. The K-Tech springs are a slightly larger outer diameter than the stock springs (shown), and after installing them in the fork, they would bind three-quarters of the way through its stroke, leading Kenefick to diagnose we had a bent fork tube. Without any time to obtain a new set of forks or straighten our current set, we were forced to stick the stock springs back in. We then added 215cc of 5w fork oil, per K-Tech’s recommendation. 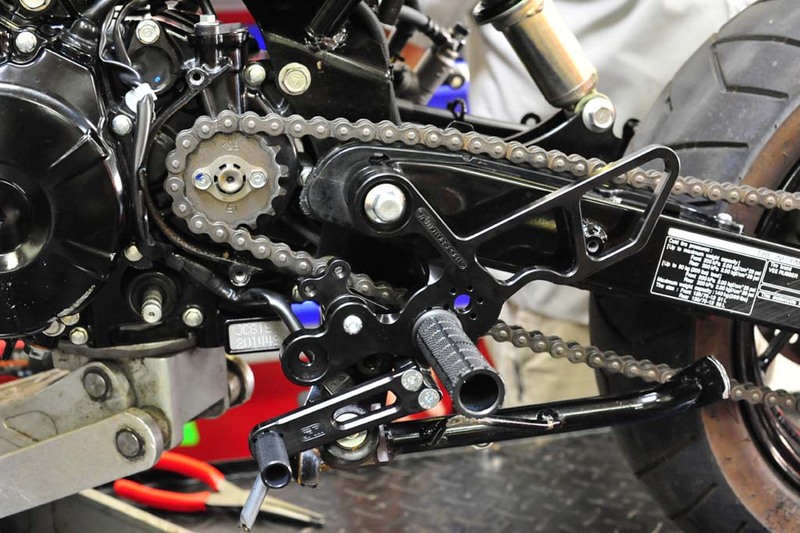 With no time to test prior to the race, a big question mark loomed over the harmony between the front and rear suspension components and how they would perform. Perhaps the single item we were most excited about utilizing were the BST carbon fiber wheels for the Grom. Compared to the OEM wheels weighing 5.8 lbs (front) and 6.9 lbs (rear), the BST wheels weigh 3.95 lbs and 4.4 lbs, respectively, for a whopping 32% weight drop in front and an impressive 36% drop in the rear. Brock’s Performance sends the wheels with the Michelin Power Pure tires pre-mounted and filled with nitrogen. 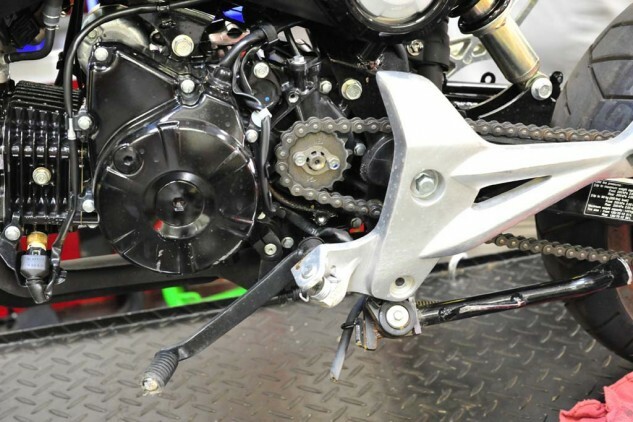 Also note the Vortex rear sprocket. Per the recommendation of other Grom teams, it was determined a 36-tooth sprocket in the rear (34-tooth stock) and 14-tooth in front (15-tooth stock) would be optimal for the Grange Motor Circuit we would be competing at. To give our Grom the proper roadrace stance, we decided to replace the stock handlebar with the CR Racing Dragster bars from Steady Garage. 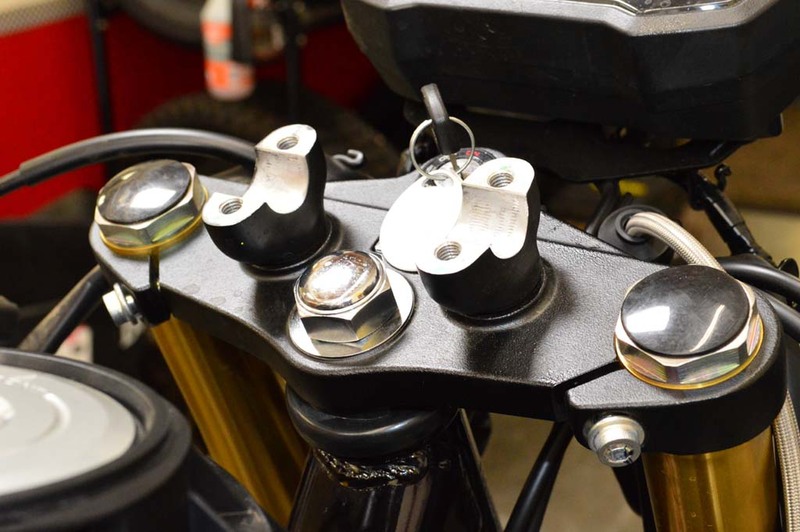 The Dragster bars mount directly on the stock handlebar mounts, so the first step is to remove the tops of the clamps. Which leaves you with this. 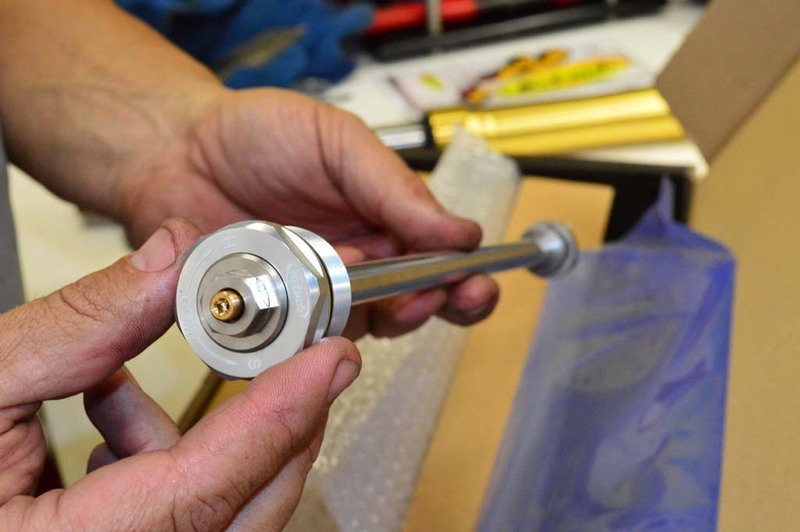 Then simply place the Dragster bars’ mounting holes on their corresponding holes in the triple-clamp mount and bolt into place. A nice feature about the bars is the ability to adjust the width of the bars by sliding it in or out of its mount. 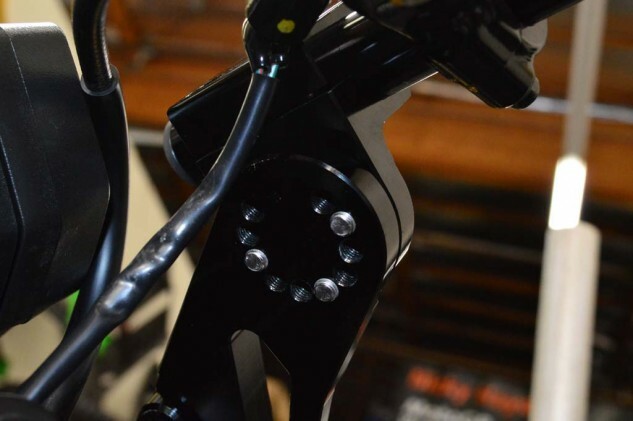 You can also adjust the angle of the bars via threaded holes to suit rider preferences. 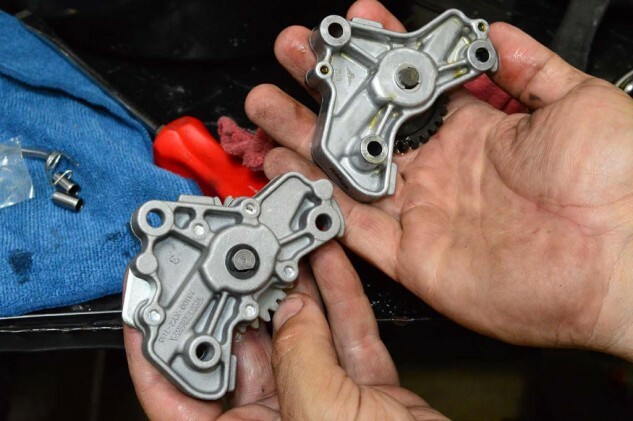 Installing the SBS sintered brake pads on the front caliper was a straightforward procedure, and they provide much more aggressive braking power over stock. Kenefick removed all of the extraneous retaining clips in the caliper for ultimate weight savings. Spiegler steel-braided brake lines were a simple install as well, though we’re not sure why the rear brake line is much longer than necessary. 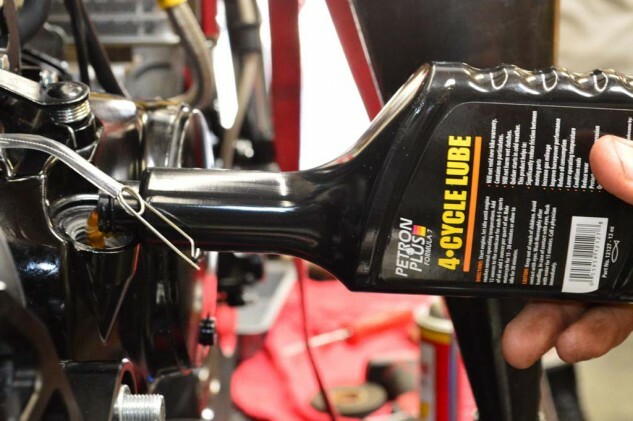 At the suggestion of Brock’s Performance we added Petron Plus Formula 7 4-Cycle Lube after refilling the oil, which claims, among other things, to “significantly reduce friction among moving parts.” This of course means more power. We like that. Lastly, per UMRA’s rules, we safety wired the oil drain plug and oil filler cap. Silicon was used to secure other important bolts, also per UMRA rules. This is what you can do with a 187-pound motorcycle. Now it’s time to go race it for 24 hours.